You are here: Home > Samsung To Reveal 5.7″ Galaxy Note III At September’s IFA Event? Samsung To Reveal 5.7″ Galaxy Note III At September’s IFA Event? 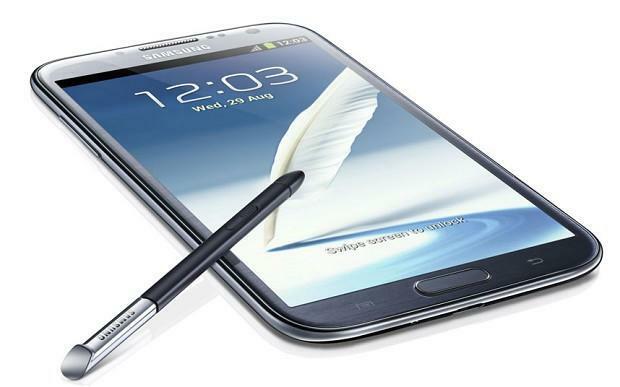 In a move that is likely to surprise no one, its once again being reported that Samsung will unveil their upcoming Galaxy Note III at September’s IFA 2013 conference. Citing industry sources, the Korea Herald claims that Samsung won’t make the announcement at a pre-IFA Unpacked event, but during the show itself. The conference begins on September 6th and runs through September 11th in Berlin. Along with this news comes a new report that the Note III will feature a 5.7″ Super AMOLED display instead of the previously rumored 5.9″ display. Other alleged specs include a quad-core Qualcomm Snapdragon 800 processor, and LTE connectivity. The 5.7″ display size was previously tipster by @evleaks and places the device firmly in the middle of the 5″ Galaxy S 4 and 6.3″ Galaxy Mega. Unveiling the Galaxy Note III at IFA is something we believe is a given when considering that Samsung unveiled the Galaxy Note II on August 29th at an Unpacked event held at last years IFA conference. With just two months before a likely Galaxy Note III announcement, we hope we’ll find some more details prior to the announcement as they are likely to begin slowly leaking out. I was hoping for the 5.9″. :/ Maybe on the Note 4. And the first one to get down-ranked and flagged. Personally, I can’t wait to upgrade from my trusty Note II to a potentially trustier Note III. Comment deleted, no “first” comments will ever stick around here! EVER! You’re so mean, David. Haha. how about the Xperia tablet Z, Aquos Pad SH-08e or Arrows Tab F-05e? Oh, and is the screen gonna be 1080p? I read somewhere quickly that no note has been over 720p yet because of the limitations of the wacom stuff…don’t know if that’s true tho. why only .2 more inches? I was thinking the screen size was also going to be bumped up to 5.9/6in, as previously rumored. I guess this slight boost in size makes sense, when you think about the first two Notes, and their slight difference in size. I wouldn’t mind having a larger device like the Galaxy Mega 6.3, with specs like that in the Note series. Waiting patiently, hopefully a worthy successor for my Note 2. Meanwhile, back in Cupertino, Apple execs continue to tout the superior benefits of their 4″ display on the iPhone 5. Why is Apple taking so long to roll out big-screen smartphones while Samsung is already selling 3rd and 4th generation ones? Glad to see Samsung continue to dominate on this … Competition and variety helps consumers! Because the big samsungnphones border on the size of a small tablet. Away from people on here, many complain at the big size of the android offerings. Case in point as to why there are still normal sized android phones are available. They sell just as much as the popular jumbo-tron galaxy anything. Just too bad they don’t have the high end specs of the bigger phones. I’d love to see something like the Motorola Razr M size phone from HTC and Samsung. Motorola put high end internals in a smaller phone. That’s where the HTC One and the Galaxy S 3and 4 come in. And to go lower the Galaxy S Blaze has a dual core processor. Regardless of them not being quad core, they should still be very powerful no? 4.7″-5″ phones are not the smaller screen phones. 4.3″ and below are and no, the Blaze is not high end internals. It’s 2011 tech and is not the same. Look at the Razr M, newest tech at the time with a 4.3″ screen and great design. So what you’re saying is Verizon can get the good stuff and T-mobile only gets second rate equipment for the smaller screens? my point is that the 2011 phones with older dual core processors should still be able to handle the current os’s and added features without a problem. they are powerful enough. not who gets crap phones and who gets high end phones. I requested a smaller screen phone with high end internals and you gush about 2 year old tech. Please, end this conversation because what you’re stating is just not what people want. unlike you or people who are into phones, others couldn’t tell the difference if an ilder tech processor were powerful enough. No need to belittle me. The Note 3 is my next Android phone, hope they put plenty of interior storage not this same old 16mb. I refuse to buy any phone with that pathetic amount of interior storage. For the kind of money we pay I’m hoping for 64mb of internal storage with of course the 64gb ext sd-card. That is a future proof device with all the bells and whistles. The Koreans get that version at their finger tips all the time, give the US market that kind of a choice. If it means more money then there are many who want it and will pay. I hope the US Carriers are listening along with Samsung. Very very few people pay the extra amount for the higher internal memory. Take the Iphone 5 for instance, when I was at Verizon I seen only about 1% of the Iphones on people’s accounts with more than 16GB. yeah… remember when 5″ was “ridiculous” as well? phones above 5.5″ (note 2 sized) are ridiculous because they no longer comfortably fit in jeans pockets. 5″ fit easy, 5.5″ fit, but tightly, and definitely won’t be comfortable when you’re walking up stairs. How about 4.3″ was crazy? Remember the HD2? I would have to agree with this. So you like the large 5.7 size and 6.4 is a stretch? Hmm… I think I’ve still got 11 months on contract for my S3. While I want this phone (I wanted the note 2, but I had *just* gotten the S3), I wonder if by the time my contract is up, the Note 4 will be late in the rumor stage. Yep, I am hoping to get a Note Mega. As the Note3 wont be that much of a difference in size from the Note2. Though I may just buy the Note3 anyway for the new features, if it looks like the Note Mega wont show up at Tmobile until 2014. Hopefully the camera features on the Note3 exceed the features of the S4 when it is finally released. I currently own a Note II, and I’ve loved it since I got it in November but I’m ready for a change. I’m kind of just tired of Touchwiz. I think I’ll be selling my Note 2 and getting a the X-Phone next. Note 3 will be awesome for sure, but pure-Android is really calling me home. Just root it and put Cyanogenmod on it. Tired of my iphone. Looking at getting the latest Android device or possibly Windows Phone 7 this fall. The Note 3 will definitely be on my radar..
Have you seen the reviews on the regular Experia Z? Yeah you get a bigger screen but it’s quality isn’t very good. Alright, I like big screens, but seriously…there is a point where you can stop and just upgrade internal hardware for a cycle or two. Love my N2 but if they keep the same size by reducing the bevel, go to full HD display, and include the features of my wife’s S4. I will have a tough decision regarding trade in. Depends on how much I can get for the N2 on Craigslist. Dual front speakers like the HTC One would be nice too , I went to too many loud rock and roll concerts and shot too many firearms without adequate hearing protection in my youth. Can’t expect true stereo separation from even a large phone unless you sit it on top of your head but added volume would be nice.